“Corsican firemen had to face an unprecedented 1500ha of forest burnt in the middle of the winter,” said the statement, by way of example in support of the trend towards longer fire seasons, with fires now occurring well beyond the dry summer months. “Forest fires are now an EU wide concern. In the Mediterranean region, fire is becoming deadlier, while in Central and Northern Europe, unusually dry summers have recently led to large fires in countries such as Sweden, Ireland and Latvia, which have historically seen very few,” said the coalition. 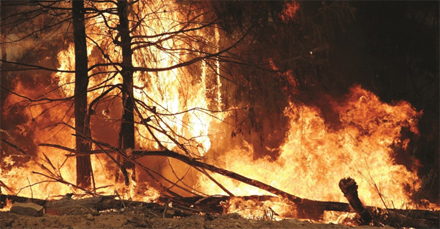 “Forest fires not only represent a serious danger for human beings and rural areas, environment and biodiversity, but also a serious threat for climate change mitigation potential of forests. CO2 in forests, representing 13% of the net removals of EU’s total greenhouse gas emissions, carbon storage in wood products and the substitution of fossil material and energy play a crucial role for climate change mitigation. When forest fires occur, all those benefits are wiped out. The forest owners and managers believe that Sustainable Forest Management practices have an important role to play in enhancing the multiple benefits of forests, whilst improving their resilience against forest fires. “Managed forests often have lower tree density and lower accumulation of dead/dry biomass, which makes them less prone to fire than unmanaged forests,” they pointed out. “Regular thinnings are also key for forest fire prevention and can be economically attractive for forest owners and managers thanks to new developing markets for small dimension roundwood and forest harvesting residues. These practices, in addition to planned and implemented preparedness and prevention measures, contribute to positive long-term impacts on forest resilience, while being adapted to local conditions of the European forest ecosystems.